Exercise is a cornerstone of good health. But for some people, exercise can trigger a potentially fatal allergic reaction. Food-dependent exercise-induced anaphylaxis (FDEIA) occurs after someone eats a specific food before exercising. As exercise increases and body temperature rises, itching and lightheadedness start; hives, asthma, and abdominal symptoms may appear; and anaphylaxis may develop. FDEIA is most common in teens and young adults. Some people have this reaction from many foods, while others have it only after eating a specific food. Wheat and shellfish are the most common offenders. It typically occurs two to four hours after ingesting a certain food, but in some people, it can be as many as 12 hours later. 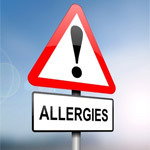 An individual with this condition may go through life eating the allergenic food without any reaction, and it's only during or after exercise that the reaction is triggered. The physical activity trigger can be moderate or strenuous, but it's thought that the more the person exerts themselves, the more severe the reaction. Identifying the food allergen can be difficult because when the ingestion of the food and the exercise are independent of each other, there are no symptoms. The diagnosis of FDEIA is usually made on the basis of the person's history. People who experience this type of reaction often have asthma and other allergic conditions. Allergists typically use skin tests to identify allergens, and then subject positive individuals to treadmill stress tests. Prevention of FDEIA is simple -- once the culprit has been identified, avoid eating it for at least four to five hours before exercising. When the specific allergen is unknown, experts recommend avoiding exercise for six hours after eating. Anyone with a history of FDEIA should always have their Epipen and all appropriate medications with them while exercising.